As we saw in an earlier post – Poverty on the rise in some states in Mexico – the total number of people living in poverty in Mexico continues to rise, though the poverty rate (as a percentage) remains roughly the same. The measures of poverty used by Mexico’s National Political and Social Development Commission (Coneval) are multidimensional, and not simply based on household or personal income. 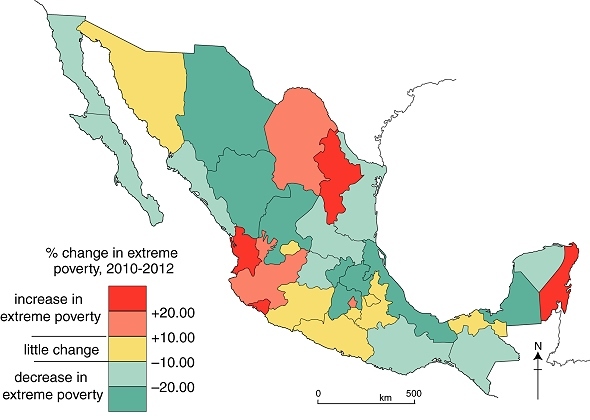 This map shows the changes in “extreme multidimensional poverty” (a category that includes “the poorest of the poor”) that occurred in Mexico between 2010 and 2012. In areas shaded red, a higher percentage of the population experienced “extreme poverty” in 2012 than in 2010; their personal situations and opportunities have presumably become significantly worse. Interestingly, this category includes the prosperous states of Nuevo León (economy based on manufacturing and services) and Quintana Roo (tourism). The reverse is true for areas shaded blue where the extreme poverty rate has fallen: many of the people living in those areas have moved out of the most extreme category and presumably have seen their fortunes and opportunities improve, even if, in most cases, not sufficiently to have escaped the “poverty” category completely. This category includes more than half of Mexico’s 32 administrative divisions. The fact that “extreme poverty” has declined in more than half of Mexico is encouraging, and suggests that government policies aimed at poverty reduction, such as Oportunidades are gradually making a difference. It remains to be seen whether or not this trend continues over the next few years.